Here is how it played out. After a quiet and petrol free morning drive of around 15 miles, I rolled up to the big service department door and it quietly opened admitting me into the cavernous and spotless bay that is somewhat reminiscent of a hanger bay on a futuristic spaceship from the mind of Lucas or Roddenberry. I eased up behind a ICE powered Nissan and then a pretty young attendant standing at a nearby computer station logged me into her system. Se then told me it would be a few hours while they serviced the Leaf but that she would be glad to shuttle me to a nearby store while I waited. I needed new boots so I took her up on the offer. 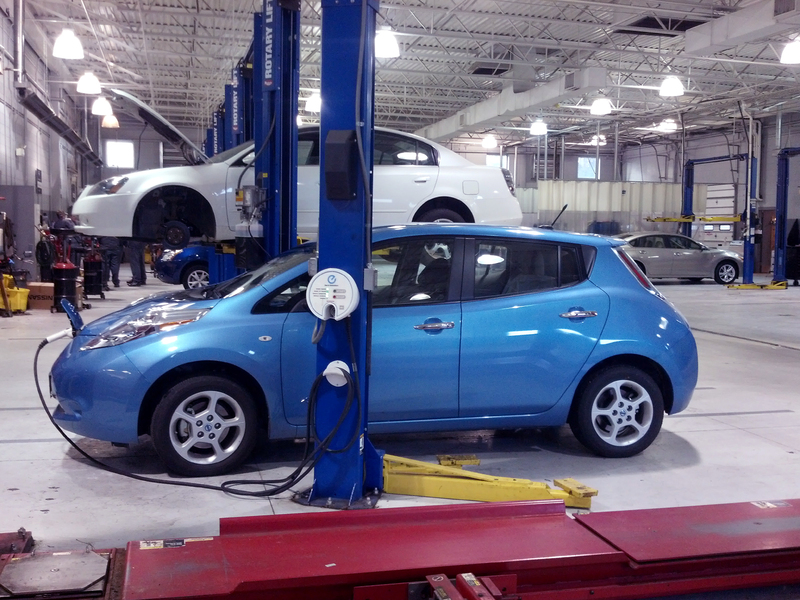 Before we departed I gained access into the service bays and snapped a pic of the Leaf before the servicing began. I was very impressed with the cleanliness, tidiness and brightness of the service department. In my many years of auto ownership I have visited and worked in many auto shops that were the exact opposite–dirty, greasy and dark–kudos to Nissan for keeping such a clean, bright service department–it truly does make a difference! The Nissan rep also plugged in my Leaf and charged it to 80% for free–a great service for EV owners that you will not see any ICE powered service departments offering. Just imagine driving your land Rover or Corvette in to have it serviced and when you pick it up they have filled up the tank for free–it would be nice but it is not ever going to happen. A couple of hours later I had a new pair of boots, my Leaf was finished, the tires were rotated and all systems were a go with a 100% score and I drove off in my Leaf with an 80% charge and smile on my face. 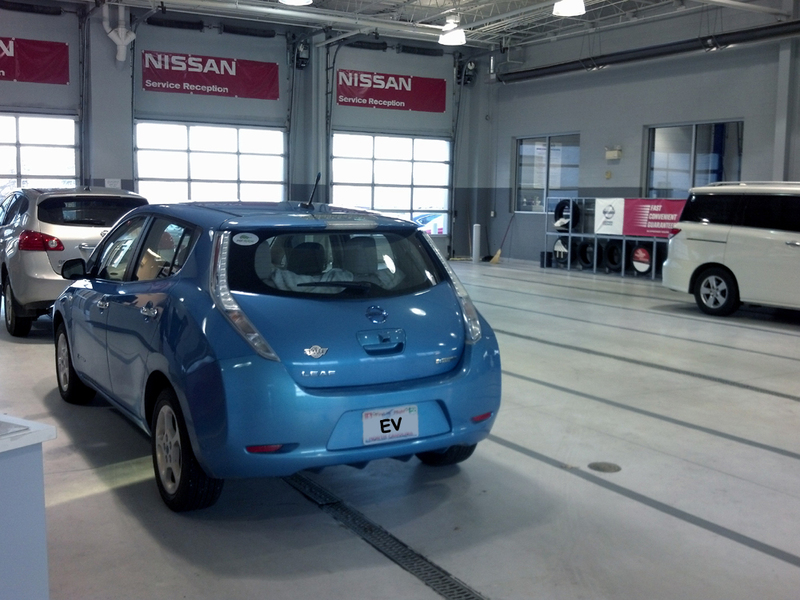 Thank you Anderson Nissan for a wonderful Leaf owners experience! 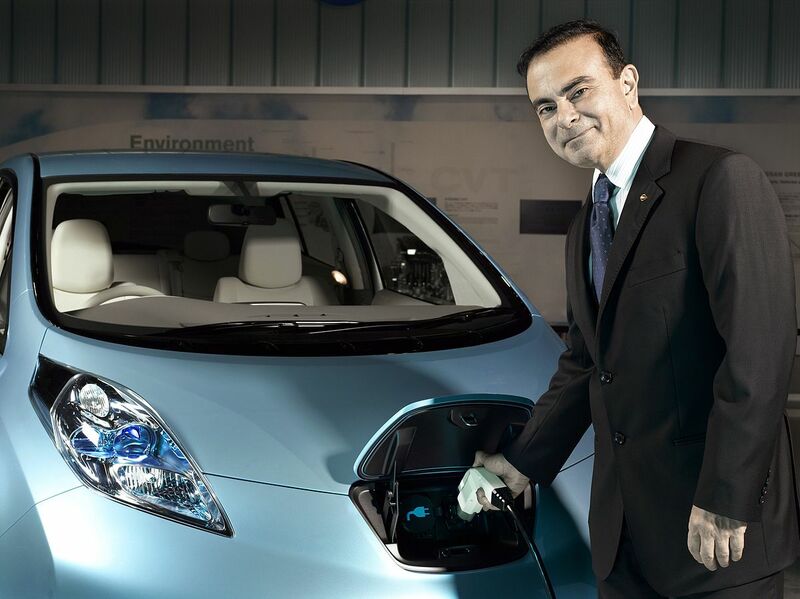 Thank you Nissan and Nissan CEO Carlos Ghosn for making the Leaf a reality! Bluewaterleaf and Steve O’Neil are not responsible or affiliated with any ads that may appear below this line.